A new year means new goals, new game plans, and new adventures. I feel like I have so many ideas and aspirations for the upcoming year, and I have a tiny feeling that 2015 is going to be one I'll remember. 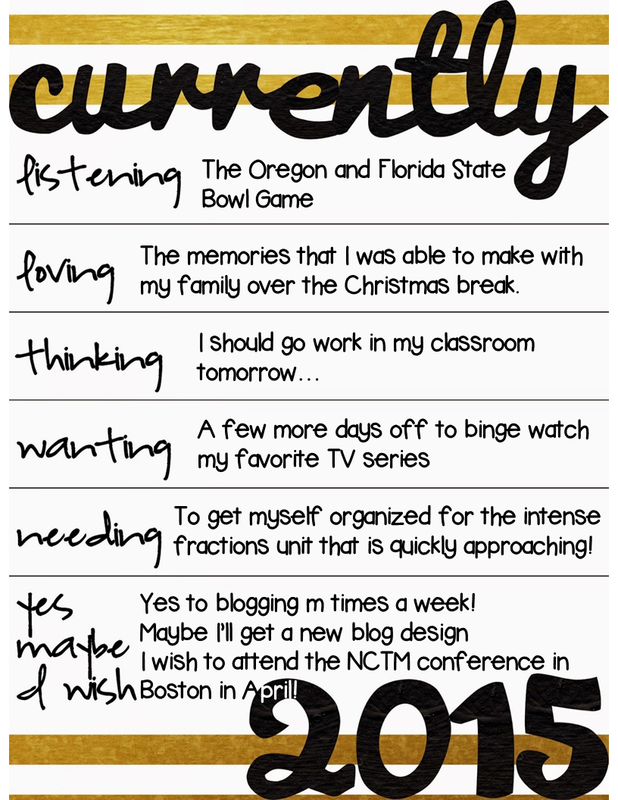 To begin the year, I am linking up with Farley from Oh' Boy Fourth Grade for her 2015 Currently linky. Listening: I am not an Oregon or Florida State fan, but the fact that football is almost over is discouraging :( I guess I'm trying to soak up all the passing and scoring I can before basketball and baseball take over. Loving: I was able to spend lots of time with my family this holiday, which I know it a luxury I take for granted. Thankfully, I was able to see all of my family for Christmas, go on relaxing getaway with my immediate family, and spend a day with my grandfather and cousins visiting the National World War II museum. Thinking: Yeah... I just e-mailed my principal and asked him to open the school for me tomorrow. I guess I better start making a list of everything I need to get accomplished in my classroom! Wanting: More of those days where I just so happen to stay in my pajamas all day while watching episodes of True Detective and Parenthood.....mmmmm...I could definitely use another week of laziness. Needing: So, I brought home tons of fraction resources to go through over the holidays for my upcoming unit, and I may have cracked open one book. I just couldn't get motivated :( Now it's crunch time! Yes: I have to manage my time better and blog more. I am saying yes to blogging 3 times a week! Maybe: I'm thinking of splurging and getting a new blog design. Who do you all recommend? Any tips? I wish: I...LOVE...MATH CONFERENCES! I am going to be begging my principal to send me to the National NCTM conference in Boston because I just feel so motivated and inspired after collaborating with educators around the nation. That's it for me on this chilly first day of January. Here's to the start of a fantasitic year! I love conferences too! I used Blogs Fit for a Queen for my design. They are wonderful to work with! I love your blog design:) I wouldn't change it, it's cute! Vicky, I am so excited that you are a new follower! I will most certainly try to give you some worthwhile reading material :) Thanks so much for the sweet comment!